Did you know that rates of loneliness have doubled in the United States since the 1980s? Studies show us that greater than 50% of people say no one knows them well, and 40% of people report isolation or feeling that their relationships are not meaningful. Worse yet, these feelings are harmful to our health, and as physicians, we face unique situations that make us even more susceptible to this growing problem. In this episode, I explain how loneliness affects physicians in particular, and what must be done to address and proactively fight against it. Listen in to learn what is contributing to this growing issue, how feeling lonely harms our health, and what we can all do to combat the loneliness epidemic. What is causing the increasing rates of loneliness. Why loneliness is bad for our health. How loneliness affects our performance at work. What makes physicians more likely to feel lonely. Who should take responsibility to fix the loneliness epidemic in the physician world. What we can do to combat loneliness. Today we’re continuing our two-part series on organizational efforts to decrease physician burnout. Last week, I described assessment tools that might help us begin our efforts for change within our organizations, and this episode is following up with examples of targeted interventions for improving physician wellness. While every organization has its own unique needs and challenges, there are plenty of options for what institutions can do to keep their doctors healthy. Listen in to hear the types of interventions that have been successful, issues that make organizational efforts less likely to make an impact, and advice for supporting physicians in all aspects of their well-being. Examples of organizational efforts to improve physician wellness. What makes interventions less likely to be successful. How to get ideas for efforts your organization can try. A common thing physicians report as a cause of burnout. What some organizations have done to ensure physicians are using their time efficiently. One area of intervention that’s grossly overlooked. What can be done to create a sense of community among physicians. The unsettling trend studies show us about women in medicine. What to do after an intervention effort takes place. Did you know that greater than 50% of American physicians report symptoms of burnout? It’s a sad truth in medicine today, and it’s not only physicians who suffer as a result. Burnout leads to decreased patient satisfaction, decreased quality of care, and increased medical errors. This is an organizational issue that has far-reaching implications, and it’s up to all of us to do something about this problem. So this week, we’re starting a two-part series addressing organizational efforts to decrease physician burnout. Listen in to learn what can be done within your institution to keep physicians healthy. What has led to such high rates of physician burnout. Problems associated with burned-out physicians. Why organizations should invest in physician wellness. How much physician turnover costs institutions. The three categories of physician wellness. Tools for understanding and measuring burnout. What can we do to help and prevent physician burnout. Where to start when working to address physician wellness. Today’s episode tackles something that many physicians struggle with: setting boundaries. Though healthy boundaries are an important aspect of wellness, it is far too common for us to want to do more than we can and stretch ourselves too thin because we don’t know how to say “no,” or because we’re afraid to. But the truth is, we’re human. We can’t do everything, and setting boundaries that communicate this is an act of self-care that can’t be ignored. If this is something you struggle with, listen in to hear the steps you can take to start setting healthy boundaries in your own life. Why it’s important to set boundaries. How having weak boundaries hurts us. The shocking percentage of physicians in America who report symptoms of burnout. What’s at the root of such high rates of physician burnout. Reasons physicians may have a hard time setting healthy boundaries. An acronym to keep in mind for dealing with people who constantly test your limits. Key steps to take for setting healthy boundaries. Few things are tougher to deal with as physicians than mistakes in medicine or unanticipated outcomes. It’s something we all experience at one point or another, and I know how hard it can be to handle the regret. I also know how challenging it can be to be kind to yourself after something like that happens. So today, we’re going to discuss what I call FGOs, or Flipping Growth Opportunities. These situations are awful, and we can’t change them, but we can choose to be gentle with ourselves and practice self-compassion. Listen in to hear advice on how to do that, what we can learn from growth opportunities, and a mindfulness exercise to help you be kind to yourself when these situations arise. What growth opportunities can teach us. The two types of mindsets we can have. Why it’s so important to have self-compassion. The three aspects of self-compassion. A mindfulness exercise to help in dealing with growth opportunities in medicine. 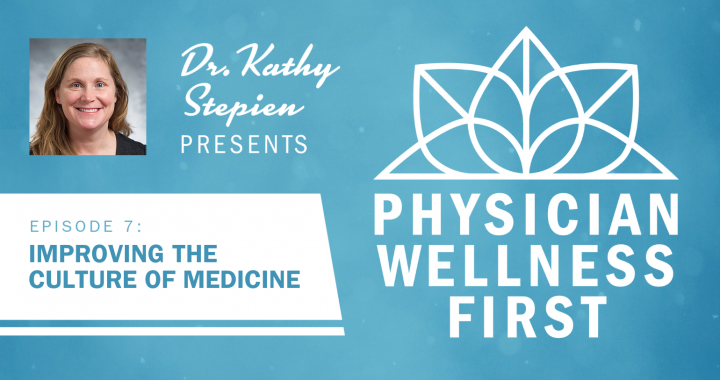 Welcome to the first episode of Physician Wellness First, the show dedicated to helping physicians learn to take care of themselves so they can take better care of their patients. 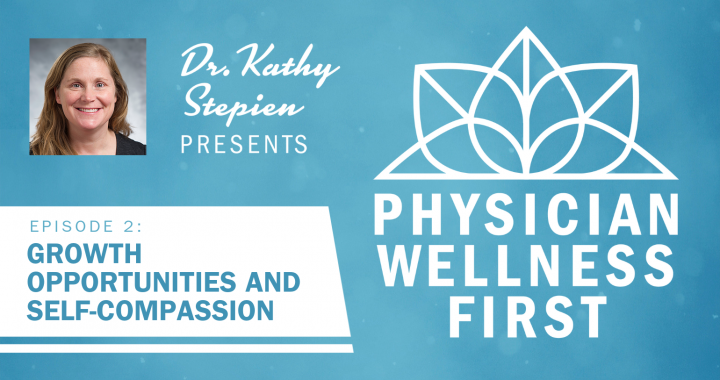 My name is Dr. Kathy Stepien, and I’m a pediatric hospitalist, as well as the founding director of The Institute for Physician Wellness. Having worked in healthcare for over 30 years, I know what it’s like to experience burnout, and my mission is to help other physicians avoid this common problem. The medical industry needs support for wellness now more than ever, and nothing is more important for wellness than the topic I’ll be discussing today: giving ourselves permission to set boundaries and identify what we need. Listen in to hear the common reasons we give ourselves for always putting others first, as well as how this hurts us, our patients, and our families. 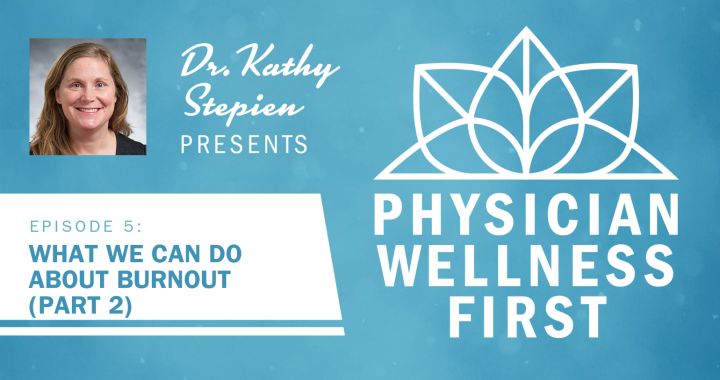 We’ll go through exercises to help you reconnect with your own needs, and end with a guided meditation that will help put you on the right path to wellness. Why it can be challenging for physicians to talk about their own wellness. Common reasons we don’t give ourselves permission to attend to our own needs. Why physician health is so important, not just for us, but for our patients, families, and communities. An exercise to help us turn toward wellness. A guided meditation to use for developing awareness. If you’re a woman in medicine who is feeling burnt out and exhausted, it’s likely you’re getting advice to do more self-care — take yourself out for lunch, get a manicure, do some yoga. Sure those things are great, but, let’s be clear, this is not self-care. I often find that when I’m feeling exhausted and down to the wire, self-care ends up as another item on my to-do list. And, counter-intuitively, I end up feeling guilty if I don’t get to it (I should be doing self-care better!) or if I do indulge, I feel bad that I’m not tackling something else on my to-do list. Why is this? We keep being told that self-care is what is going to solve all of our problems, so why isn’t it working? It’s because this “faux self-care” that we are being offered is not actually feeding us. If feeling confident and empowered were as easy as spa days and meal delivery service, life would be much easier! Self-care is the internal hard work of making tough decisions for yourself and by yourself. It starts with recognizing that you have limits, and you really do have to choose what you prioritize because just like everyone else, you are human. It’s actually not that pleasant of a process, because it means you have to set boundaries. It means that you have to learn how to say no, and recognize that it’s nobody else’s responsibility to say no for you. This is especially difficult for women in medicine, because many of us have gotten to where we are by putting on that superwoman cape, and playing the role of savior. Or, perhaps, martyr? It means taking less pride in being busy and efficient. We need to stop letting our hyper-productivity-oriented medical culture disconnect us from our values. For women in medicine, martyrdom is almost an epidemic. What martyrdom gets you is exhausted, burnt out, and still running at full speed pretending that you love to help everyone else, but actually just oozing resentment. It’s a formula that’s set up to fail. For me, setting boundaries means pausing whenever anyone asks me to do something, and remembering I have three choices. I can say yes, I can say no, or I can negotiate. For a long time, I didn’t recognize I had option 2 or 3. For most of us in medical school and residency or fellowship, it did not feel like we had the option to choose. Especially if you are a high achiever, there’s a way that hyper-productivity can be exhilarating. It means that you are better than those other people! What we didn’t recognize was the cost. And, now, as a psychiatrist specializing in women’s mental health, and a woman with more life experience, I’ve learned that we always end up paying, in one way or another. So, part of learning to set boundaries is internalizing the fact that you do have limits and there is nothing wrong with that. What’s broken right now in medicine is the system, not us as physicians. The problem with resilience or faux self-care is that it puts the burden of change on the individual, and exonerates the system. You can make as many to do lists as you want, have the best meal delivery service in the city, and eventually, you will reach your limit. And, you will always feel ashamed for reaching your limit, because that is what our medical culture prescribes. You will feel like it’s your fault, and you should do more, but in fact, when you have boundaries, it’s possible to see that you’re running a race that has no finish line. So, why does medicine keep selling us this panacea of resilience and self-care? I think because it puts the burden on us as the hyper-achieving physicians. And, we have certainly shown that we are capable of doing everything, plus much more than is asked of us. Doctors do not need to be more resilient. In fact, doctors have been too resilient, and that’s part of what got us into this situation. We thought that if we put our heads down and delivered more (ie. master clinicians, experts at billing, running the office, oh and, saving lives) eventually, the powers that be would be satisfied and we would be taken care of. But, that’s the tricky thing about boundaries; nobody else can set them for you. You should also know that it can feel bad to set boundaries. Self-care is valuing your own feelings and thoughts, despite knowing that you may let other people down. It means being able to tolerate other people’s disappointment and trust that it is not a moral failing on your part. Forget the image of self-care you have in your mind of you luxuriating at the spa. Self-care means going through your list of work projects and sending that email saying your plate is full so sorry, you won’t be able to make that meeting. This is what it feels like to be responsible for taking care of your own emotions. Many of us did not develop this muscle growing up, and so, it’s not unusual to feel the growing pains when you start doing this as an adult. But, in my experience, facing those growing pains directly pays off multiple times over. You end up learning to value your time, your feelings, and your goals. And, perhaps counter-intuitively, when I am setting boundaries, I find myself feeling generous, full and willing to give more to others without feeling resentful. I also find myself able to indulge in “faux self-care” without feelings of guilt or pressure to perform. Once the resentment and guilt creep back in, I know it’s time to start cleaning house. Setting boundaries in order to take care of myself is not a one-time thing, it must be repeated regularly until it becomes second nature. If practicing self-care means regularly setting boundaries, one difficulty is the qualities that got us into medicine, and kept us here, are precisely the ones that work against us. We want to be needed and valued by our patients, we are conscientious to the point of perfectionism, we recognize the inherent privilege and burden of taking care of people in their most vulnerable state, and are more comfortable sacrificing our own needs in the service of others. Inherent in this is the assumption that eventually if we make ourselves small enough, we will get that “A”! Make no mistake; setting boundaries is an assertion of power. We’ve been told over and over again that we don’t matter, and when we do, we’re certainly worth less than men. For women in medicine, setting limits and asserting boundaries is about saying this is what works for me, and this is what doesn’t. It’s having the audacity to say, I exist and I matter. Pooja Lakshmin, MD is a board-certified psychiatrist and Assistant Professor of Psychiatry & Behavioral Sciences at the George Washington University School of Medicine. She is passionate about women’s mental health. You can find her on twitter @PoojaLakshmin. She is a 2018–2019 Doximity Author. I missed this April, 2018 JAMA article and wonder whether you have too. • Effective patient care promotes and requires physician well-being. • Physician well-being is related with the well-being of all members of the health care team. 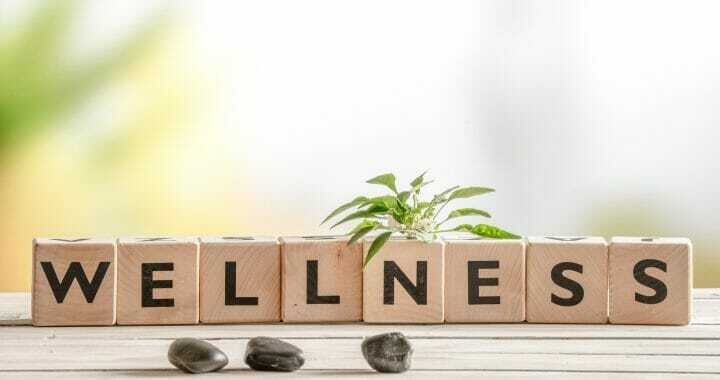 • Physician well-being is a quality marker. 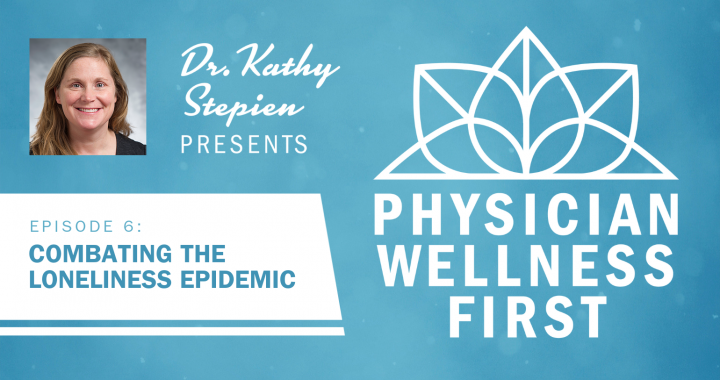 • Physician well-being is a shared responsibility. The problems are real. Conversations about this topic are becoming mainstream. Let’s all work together for change. We, our colleagues, our patients, our families, and our communities need healthier physicians. Plans are underway for our spring wellness retreat. Check back soon for dates and details!